The Muslim Brotherhood called for an "Islamic Intifada" – a violent uprising – against Israel Friday following the day's deadly Palestinian terrorist attack in Jerusalem. 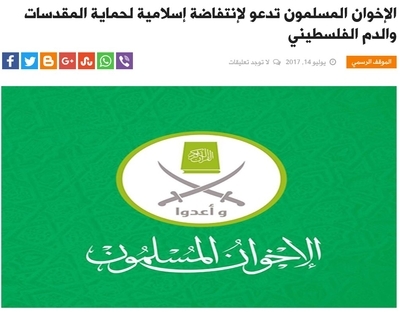 "The Muslim Brotherhood calls upon the sons of the Islamic Umma (nation), its Ulema (Muslim religious scholars), figures and blocs for an Intifada in order to stop the (alleged Israeli) violations of holy sites...," the Brotherhood wrote on its official Arabic-language website and translated by the Investigative Project on Terrorism (IPT). Palestinian terrorist organizations Hamas and the Palestinian Islamic Jihad followed the Muslim Brotherhood's lead with a joint statement on Monday, also translated by IPT, "calling on the masses of the Palestinian people to prepare and declare a general mobilization to defend al-Aqsa Mosque and to escalate the Quds Intifada." The Brotherhood admitted its main motivation for "our intended uprising" is to "pressure all Western governments, Arab regimes and international organizations to intervene to stop violations by gangs of the Zionist entity..."
On Friday, three Israeli-Arab terrorists from Umm-al Fahm shot and killed two Israeli police officers of Druze descent at the Temple Mount. Other police officers shot the terrorists dead after they retreated into the Temple Mount compound. According to the Times of Israel, the attackers were reportedly members of the banned Northern Branch of the Islamic Movement, a Muslim Brotherhood affiliated organization led by a radical Arab Israeli Raed Salah and former mayor of Umm al-Fahm. The Jerusalem Post later interviewed several residents of Umm el-Fahm, many of whom believe that the al-Aksa mosque is under threat by Israel. Some of the respondents believe the Israeli-Arab terrorists were motivated to kill by this belief. "They did this because of the feeling that al-Aksa is in danger," a young man told the Jerusalem Post. "Every year we used to have a festival on the theme 'al-Aksa is in danger.' Since the government banned the movement, we no longer have it, but a lot of people still support the movement." The Northern Branch of the Islamic Movement controlled Umm el-Fahm for 21 years and maintains a strong support base in the area. "Al-Aksa is in danger" is the Islamic Movement's mantra. The Muslim Brotherhood's statement reaffirms the organization's extremist and divisive worldview, labeling any Muslim a "traitor" if they fail to join the uprising: "The Muslim Brotherhood stresses that defending holy places, and blood and goods is a Sharia duty and a duty to every Muslim, which cannot be ignored except by a traitor or someone submissive." Brotherhood spiritual leader Yusuf al-Qaradawi also issued a series of statements during the past couple of days inciting Muslims to join the struggle against Israel. "It is incumbent on the Umma of Islam to leave aside minor issues and side battles, and be concerned with the primary cause of Islam: the cause of Palestine and what the prisoner al Aqsa Mosque is being subject to," Qaradawi wrote in a Twitter post Monday. The most recent attack in Israel and the Brotherhood's subsequent call for an intifada is the latest example of Muslim Brotherhood-sanctioned violence. In April, senior Muslim Brotherhood member 'Izz Al-Din Dwedar called for an "intifada" targeting Egyptian embassies around the world in a Facebook post translated by The Middle East Media Research Institute (MEMRI). Egyptians abroad should "protest [outside] Egyptian embassies and lay siege to them, and steadily escalate [their actions], up to and including raiding the embassies in some countries, disrupting their work and occupying them if possible, in order to raises awareness to our cause," Dwedar wrote.